Kavu’s are sacred gardens. There is diversity in deities worshipped in Kavu’s. Each has a presiding deity and most of them have associated deities too. The theyyam stands as a symbol of goodwill, prosperity and also to ward off evil spirit, poverty and illness. Theyyam represents a mythological, divine, ancestral, animal, serpent or heroic character each with its distinct shape form and story of origin. 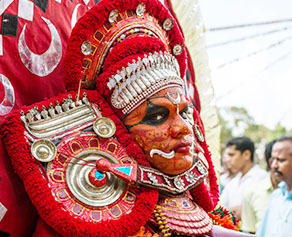 The head dress, face painting, breast plate, bracelets, garlands, and fabric attire in each theyyam is distinct and meticulously crafted according to the character presented. People see and adore the Theyyam as God. The main peculiarity of the Living God is that they can able to talk to its devotees. People consider their voice as the voice of God. The voice of Theyyakkolam is called “Uriyadu Kelppikkal”. People narrates their problems and worries to the Living God and offer money and other devine materials as “Vazhipad”. In return the Theyyakkolam will give a kind of powder as “Prasadam” (‘Kuri’ made from rice and turmeric) and will console the devotees by chanting certain devine words for their relief. Even the serious problem prevailed in the societies were solved through Theyyakkolams. It is believed that certain Kolams even eradicated dreadful endemic diseases from the society. They directly visit their home and throws the “Kuri Prasadam” to the patient and give relief from the ailment. Tha Malayalam day Thulam 10, (October 27) Malabarians celebrate it as Pathamudayam’. The day has immense importance in North Malabar as the day ensures self sufficiency of the agricultural crops and sound wealth and health of the common people. Almost all the sacred shrines in North Malabar are performing certain poojas and rituals during the occasion to appease their God and Goddesses. More over the shrines like Kavu, Kotam and certain temples are starting their open ceremonies for the season to welcome their living God ‘Theyyam’. This particular day is called ‘Pathamudayam’ and the function performed during the day is generally termed as ‘Puthari Ulsavam’. This is the starting day of the Theyyam performance in North Malabar. Most of the Kavu and shrines perform half make up theyyam called ‘Vellatam’ and original full make up theyyam will perform later during the calendar date. The Chathampalli Kshethram in Kattamballi performs the first theyyam kaliyattam during the season and Vishakandan theyyam is famous here. There are about 450 known forms of theyyam and each cult has its own style of performances. Each has its own costumes and make up and way of presentations. There are rituals and customs like theyyam jump in to the big heap of fire, play marital arts, climbs the tree, visit to neighboring temples, visit to homes, killing hens, group performances etc. The myth and legends of the theyyam had been converted in the form of poems. The supporting artists recite these poems during the theyyam thotam as well as in the beginning of theyyam performance. These stories differ in each cult depend upon its origin and how these forms originated. There are theyyam performances in day time as well as in the late night and early morning. The night theyyam usually performs with coconut leaves torch light and clothe torches and the awesome environment in the pitch darkness, moonlight and starry sky provides a glorious devotional ambience for the spectators.